In January Miloš Zeman of the Party of Civic Rights – Zeman’s people (SPOZ) was elected president. He took office in March. This began a period of cohabitation because SPOZ is not represented in the government. That said, the situation is beautifully complex. SPOZ was a break away party from the now opposition Czech Social Democratic Party (ČSSD). Now, SPOZ is not represented in the lower house, though it does have one senator. I do not know enough about Czech politics to be sure, but this does raise the issue of whether SPOZ is a ‘real’ party. If it is, then there is definitely cohabitation. If it isn’t, then it is an open question as to whether the president is ‘really’ partisan. If not, then there would not be a period of cohabitation. If he was not really partisan any more, the situation would be similar to the one in Slovakia where President Gašparovič was once partisan, but where his party disappeared leaving him as an independent, albeit one effectively supported by SMER. Anyway, let us assume SPOZ is a real party. The government comprises ODS, TOP ’09, and still, as I understand it, LIDEM. The Senate is controlled by the ČSSD. Here’s the rub. Art. 84 of the constitution states that “The Justices of the Constitutional Court shall be appointed by the President of the Republic with the consent of the Senate.” Today, President Zeman nominated four new justices. What would the Senate do? Without any real partisan basis, would the president’s nominees be accepted? Newspaper reports confirm that the justices were appointed, with support for the president’s candidates ranging from 61 of 72 votes case to 53. The newspaper speculates that this suggests the president is still able to gain support from the ČSSD, even though they parted on bad company. Apparently, a further four judges will be appointed in the summer. So, the president will have the opportunity to test his support again soon. This entry was posted in Czech Republic on 25 April, 2013 by Robert Elgie. 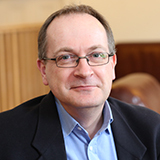 This entry was posted in Cohabitation, Czech Republic, List of cohabitations on 8 March, 2013 by Robert Elgie. So, consistent with the predictions of commentators like Sean Hanley, former PM Milos Zeman is the new president. As reported in a recent article, the Czech president has very few powers. So, we have yet another directly elected but figurehead president to add to the list. That said, the president is not a cipher. According to my figures. PresidentKlaus has vetoed no fewer than 63 bills since 2003. In addition, his decision to amnesty a large number of prisoners at the New Year caused a political storm. So, even if the Czech president is weak, the institution has the capacity to be both politically active and controversial. Moreover, the election of Zeman will lead to a period of cohabitation. The government of Petr Necas comprises the ODS, TOP 09 and LIDEM parties. The CSDP is in opposition. So, the Czech Republic will get a real taste of semi-presidentialism when President-elect Zeman takes office in March. This entry was posted in Czech Republic on 26 January, 2013 by Robert Elgie. The Czech Republic held its first ever direct presidential election on Friday/Saturday. This followed last year’s constitutional amendment. So, the second round of the election will take place on 25-26 January. 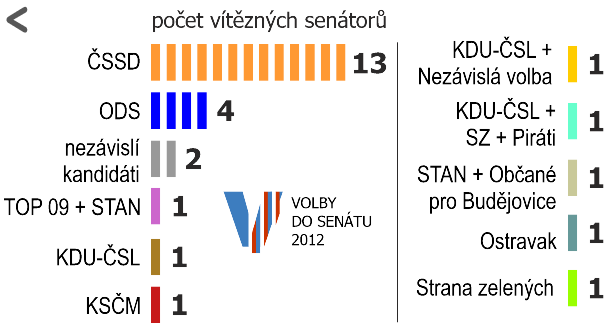 The two candidates, Miloš Zeman and Karel Schwarzenberg, are both relatively pro-European. Zeman is from the social democratic side of the political spectrum, whereas Schwarzenberg is from the liberal tradition. Zeman was PM from 1998-2002. Schwarzenberg is the current Foreign Minister. Currently, the Czech government is unpopular and has faced various political difficulties. Specifically, it is now a minority government, though it can generally rely on the support of independents to stay in office. This will be put to the test next week. Reuters, via Parlgov, is reporting that the government faces a vote of no-confidence on 17 January. This is in response to President Klaus’s controversial decision at the New Year to amnesty around a quarter of prisoners in the country on the 20th anniversary of the Republic. The domestic politics of the government may affect the vote for the presidential candidates at the second round. This entry was posted in Czech Republic on 13 January, 2013 by Robert Elgie. At the first round of the Senate elections last week, the ruling coalition in the Czech Republic, the Civic Democratic party (ODS), TOP ’09, and Public Affairs (VV), were in a difficult position. At the second round, the main questions were how many seats would the ODS lose and would the opposition left win enough seats for a so-called constitutional majority of 49/81 seats in the upper house? The answer to the first question is 10 and the answer to the second is ‘yes’. The CSSD are the Social Democrats and the KSČM are the Communists. Nezávislí kandidáti means ‘independent candidates’. So, the CSSD, KCSM and ex-CSSD Senators have 49 seats. The newspaper reports vary as to whether this will make a difference to the government’s control of the law-making process. However, it is clear that the government is currently is unpopular and is in an increasingly difficult position. This entry was posted in Czech Republic on 22 October, 2012 by Robert Elgie. The Czech Republic is the newest semi-presidential country. The first direct presidential election will take place in January 2013. However, there may be a general election before then. The current coalition comprises the Civic Democratic party (ODS), TOP ’09, and Public Affairs (VV). They are currently facing a possible vote of no-confidence. On Saturday, there were local elections as well as elections for one-third of the Senate. The ruling parties did badly, perhaps precipitating a general election. CTK reports the following figures: the opposition Social Democrats (CSSD) won 23.6%, the Communists (KCSM) won 20.4%, the ODS won 12.3%, the extra-parliamentary Christian Democrats (KDU-CSL) won 9.9%, and TOP 09/STAN won 6.6%. No other party crossed the 5% threshold. According to the report, this means that the CSSD will win nine regions, the KCSM will win two, the ODS will win one, and a regional list will win one. In the Senate 27 constituencies were contested. CTK reports that the ODS held 14 of these seats prior to the election. However, it has qualified for the second round in a week’s time in just 10 constituencies. So, it will face big losses. By contrast, the CSSD will compete at the second round in 23 constituencies. The biggest change was that the KCSM will compete in 12 constituencies compared with none two years ago. My understanding, though, is that the CSSD and the KCSM will be competing against each other in some constituencies, so the opposition gains will be limited, even if they will definitely gain seats overall. 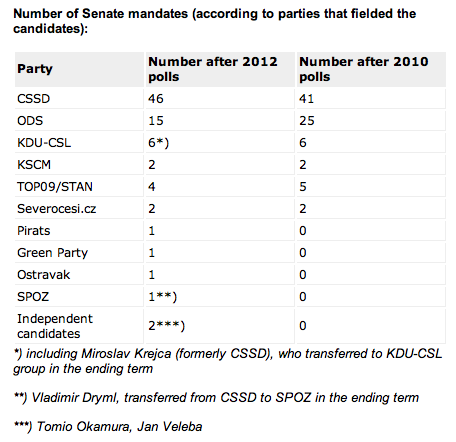 CTK estimates that the CSSD will win nine Senate seats, ODS six, the KDU-CSL two, and the KCSM perhaps only one or two. Overall, though, this was clearly a bad election for the incumbent government. This entry was posted in Czech Republic on 14 October, 2012 by Robert Elgie. The Czech Republic will become semi-presidential on 1 October. A constitutional amendment to introduce the direct election of the president was passed by both chambers of the legislature last month. The Act takes effect in October. The first direct election will be held in 2013. I do not have the text of the amendment in English. However, there are French, German and Russian versions here. The constitution before it was amended is available in English here. The system will be a premier-presidential form of semi-presidentialism. Generally, the Czech Republic will enter the set of countries with a weak directly elected president. For example, Siaroff gives the Czech president a score of 1/9 for presidential powers. Those who use the Shugart and Carey schema (or an amended version of it) also give the Czech president a low score. For example, using Metcalf’s revised version of the Shugart and Carey framework, Tavits gives the Czech president a score of 5/44. The recent amendment only deals with the method of election. The president’s powers remain unchanged. I would like to thank Miroslav Makajev for letting me know that the reform had been passed. This entry was posted in Czech Republic on 30 March, 2012 by Robert Elgie. The government of the Czech Republic has approved a bill to introduce the direct election of the president. If passed, this would introduce semi-presidentialism. The report is in České Noviny and many thanks to people at the excellent parlgov site for the tip-off. According to the report, some basic issues have yet to be agreed, including the president’s powers and the term of office. The current constitution of the Czech Republic is available here. Art 39 (4) states: The concurrence of three-fifths of all Deputies and three-fifths of all Senators present is required for the adoption of a constitutional act. The government is a three-party coalition that does not quite have a three-fifths majority in the Chamber of Deputies and is far from such a majority in the Senate. This seems to mean that the support of the opposition Czech Social Democratic Party will be required. I have no sense as to whether such support will be forthcoming. This entry was posted in Czech Republic on 20 June, 2011 by Robert Elgie. Czech Republic – Semi-presidentialism under consideration? At the end of May there was a vote in the parliament of the Czech Republic to introduce the direct election of the president and, hence, semi-presidentialism. The proposal was approved by 103 deputies, but 120 votes in the 200-seat parliament were required for the reform to be passed. This was not the first attempt at such a reform. According to the Prague Daily Monitor, this time the reform was proposed by the Czech Social Democrats (ČSSD), though all parties have indicated that they are willing to introduce direct elections before the date of the next scheduled presidential election in 2013. This vote was taken before the June parliamentary election at which the Social Democrats lost seats. However, the Czech News Agency reports that the new three-party coalition of the Civic Democrats (ODS), TOP 09 and the Public Affairs (VV) as well as the opposition Social Democrats are still in favour of the reform, which, apparently, has public support. This entry was posted in Czech Republic on 16 July, 2010 by Robert Elgie.